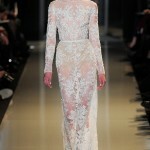 Drawing inspiration from old Hollywood, embroideries on lace, with a touch of déjà vu. 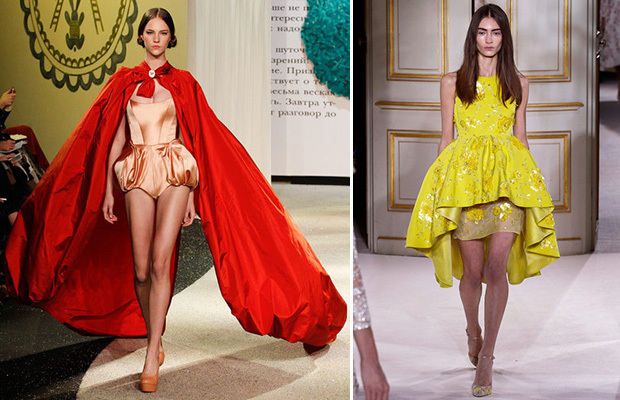 We are showcasing our pics of the top 3 Couture designers and their runway looks of 2013. Saab seduced Hollywood years ago. The fashion crowd has taken longer to come around. 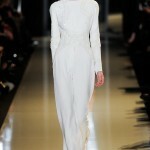 Insiders saw shades of other designers in his dresses today—floor-skimming capes that called to mind Gwyneth Paltrow’s white Tom Ford from last year’s Academy Awards, demure necklines and long sleeves evocative of recent Valentino collections. What was signature Saab, of course, was the beadwork, this time rendered in tone-on-tone or silvery embroideries on lace and tulle of varying transparencies. An Ode to Delicateness, he called the collection, and, indeed, with illusion necklines and sheer sleeves, his creations at times seemed to float on the body. Saab used mostly pastels, with a touch of red and black. He’s always favored solid colors; prints have proven tricky for him. This time, though, a subtle multicolor floral over-embroidered in black beads produced the most charming dresses, especially a three-quarter-sleeve, full-skirted party number. It’s not Oscars material, but it was a knockout. “Gone With the Wind, the Headless Horseman, Huck Finn—it’s our American collection,” Ulyana Sergeenko said before her second Couture show today. Having explored her Russian roots at her debut in July, Sergeenko was eager to surprise. If nothing else, the U.S. contingent was amused by a soundtrack that ranged from The Wizard of Oz to Django Unchained to Rocky. There wasn’t a bad tune in the lot, but their cumulative effect bordered on kitsch. Sergeenko’s clothes are unapologetically theatrical. Scarlett O’Hara’s widow’s weeds made an appearance, as did her famous green curtain dress. One model carried a bindle down the Théâtre Marigny runway, and another hitched a wooden slingshot into her belt. 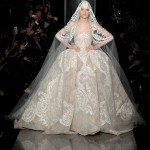 To some, the Russian is better suited to Hollywood back lots than to Paris haute couture. Certainly, outfits like a corseted velvet onesie and taffeta balloon cape, or a ball skirt worn with nothing but a pointy bra, seemed self-indulgent. The mistakes of a neophyte. 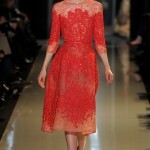 Giambattista Valli has a distinctive advantage as a couturier: He is utterly intimate with his clientele. Age-group 28 to 38, spring chickens in the couture sorority, and innocent of the traditional iconography of alta moda. Which means Valli is able to toy with tradition in a way that seems entirely fresh to his women. In the past, that has meant a soupçon of déjà vu for everyone else, but by some fortunate alchemy, the collection he presented tonight took those antique Roman codes, twirled them around, and deposited something old-but-new on the catwalk. Maybe all it took was basic black and white. Valli opened with a coat-dress in big-cat spots, followed through with a jacket and skirt ensemble traced in black, and consummated the monochrome with a tulle-shrouded black shift clasped at the waist with Luigi Scialanga’s twist of metallic feathers. That statement of intent resonated through the first half of the collection, producing outfits as striking as a croc-collared black shift with an inky squelch of sheen trailing down its front, and an ocelot-spot jumpsuit with an overlay of mousseline that trailed away dramatically.